Yeah, well, as the title says, I participated in a battle with the staff at Battle Bunker, but because of his job and mine, we couldn't finish the game. Customers came, he needed to...well, work. And I had to leave at 2pm because I had rush off to my university for a job. I'm a Masters student in a local university, so I have responsibilities and stuff. Oh well. 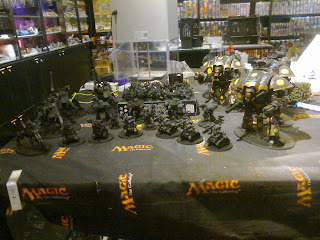 Anyway, here's an image of my completed Adeptus Mechanicus Army. So yeah, my Adeptus Mechanicus War Convocation is completed. 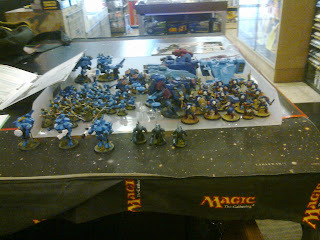 It's too bad I couldn't wait for the other staff to come and play against my newly completed War Convocation with his Space Wolves. 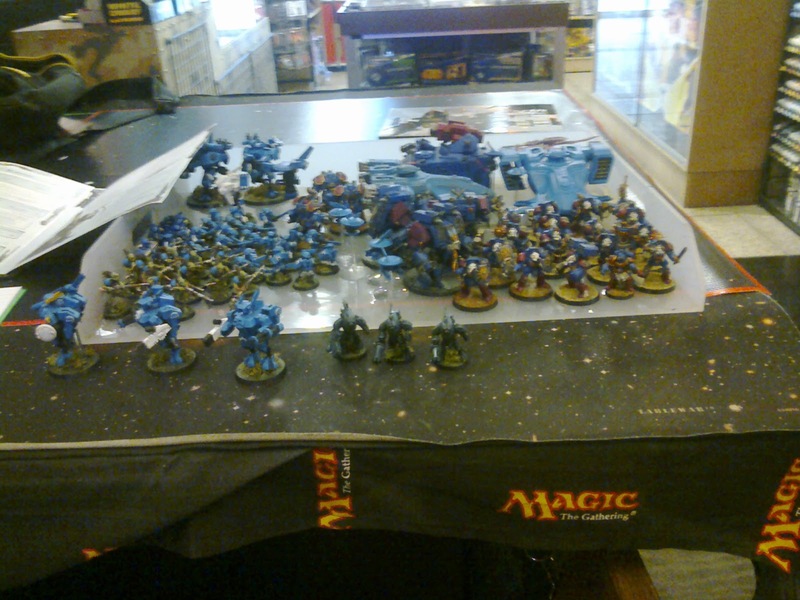 Instead, I ended up playing against the employee who plays Tau. He was selecting forces for a 750-point game and with nothing better to do I offered to be a guinea pig to his test. Well, I was tempted to try out my new Skitarii, but 750 points was just right for 2 Imperial Knights and I suggested that as I found the idea of assembling a new 750-point too troublesome. 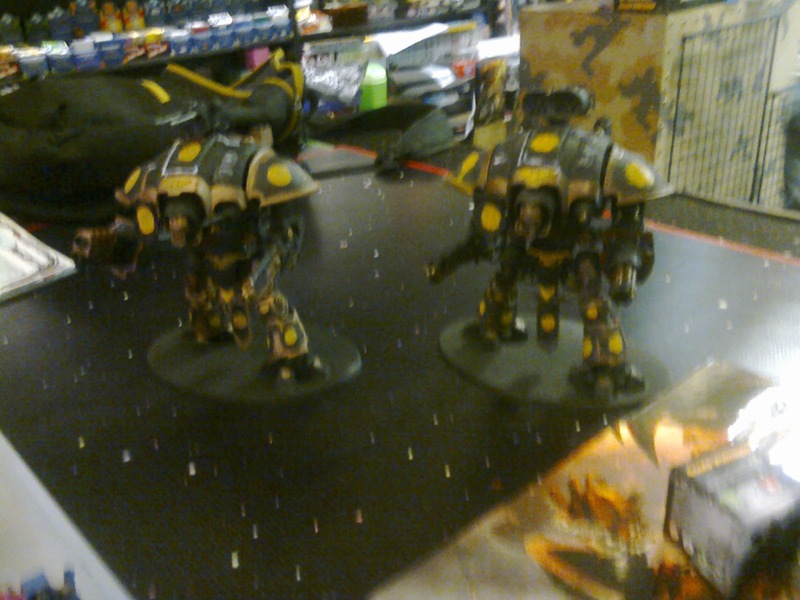 He agreed, so I fielded 2 Imperial Knights, a Knight Errant and a Knight Warden. My opponent deployed 2 teams fo Fire Warriors, a Fireblade Cadre, 2 Broadside suits with heavy rail rifle, a team of 3 Stealth suits and a team of 3 Crisis suits. The game only lasted two turns. First turn, my opponent moved his Fire Warriors up while the Broadsides blasted away at my Knight Errant. Strength 8 versus AV13, and he rolled less than five so both shots didn't do anything. My turn, I killed a Broadside with my Knight Errant's thermal cannon, and my heavy stubber killed two Fire Warriors. I attempted to charge but failed. On the other side, my Knight Warden fired his meltagun, it hit but it failed to wound because I rolled a one. Then my Avenger Gatling Cannon took out a large chunk of the Fire Warriors and they passed their morale check. Charged, but again I failed. And my heavy flamer couldn't reach them. My opponent's next turn and he continued moving the Fire Warriors up into cover (well, they were already in cover). He deep striked his Crisis Suits and Stealth Suits. 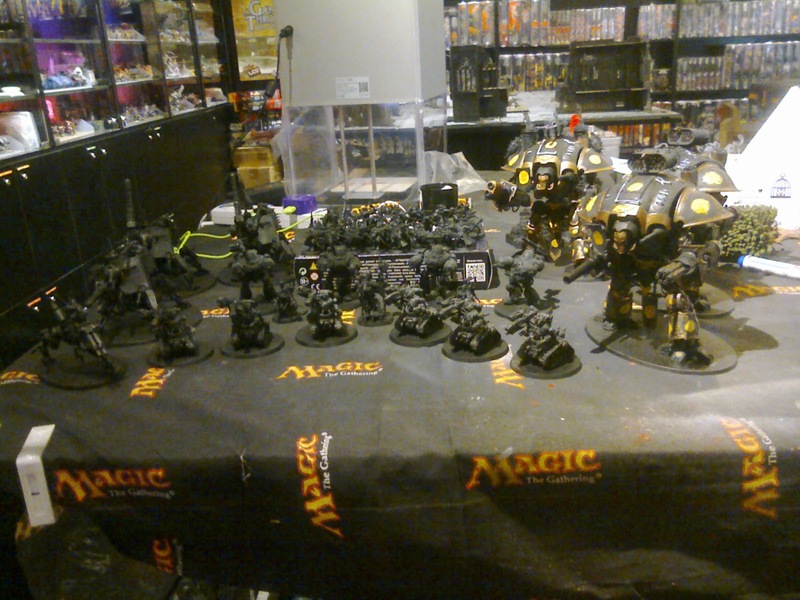 Only the Steath Suits made it onto the table. He got his Fire Warriors to throw EMP grenades at my Knight Warden, but he passed his ion shield. Then the surviving Broadside, who passed his morale check earlier, glanced my poor Knight Errant, as did the Fire Warriors with their EMP grenades. The Stealth Suit fired his fusion blaster and peneetrated, but rolled badly on the vehicle damage table so he only took a single hull point off. My Knight Errant was down to 3 hull points. I wanted to continue, but a family came in and he had to leave to tend to sales. Following which, one of the bosses needed him to do stuff like get the Microsoft Office for a new office laptop (the old one spoiled or something). At this rate I couldn't continue the game as the clock was ticking and I had to head for my university, so I called it a day and kept my stuff. Still, I can't wait to play my new Adeptus Mechanicus War Convocation! I'm not confident that I will win any games but at the very least I'll deal a lot of damage before I get tabled. And I feel so tempted to just buy the Cadian Defense Force and convert it into the Draconian Defense Force. If I do, I'll rewrite Chapter 7 and get rid of the Leman Russ Punishers and Leman Russ Demolishers in the last chapter and focus on putting in armor infantry and stuff. I hope. We'll see. By the way, I'm almost done with Flesh and Blood by Henry Zou. It's one of the darkest and most brutal novels I've ever read, even among all the 40K novels and I'm just...traumatized by it, Yet at the same time I can relate to it because the soldiers feel utterly realistic, extremely human and just so well developed. They remind me of myself during my time in the military, the growth, the changes, the transformation...the numbing. It's so realistic and hit so close to home for me. The 88th Battalion of the 31st Riverine acted, believed and thought just like my buddies and me during our years of service, complaining about the same things, etc. At the same time, it isn't identical, but because we went through similar experiences, needing water during missions, fearing heatstroke, surviving ambushes in the jungle, etc. It just felt so close to me. I'll elaborate more in my book review when I actually finish reading the book. I can't wait to write a book review on it! 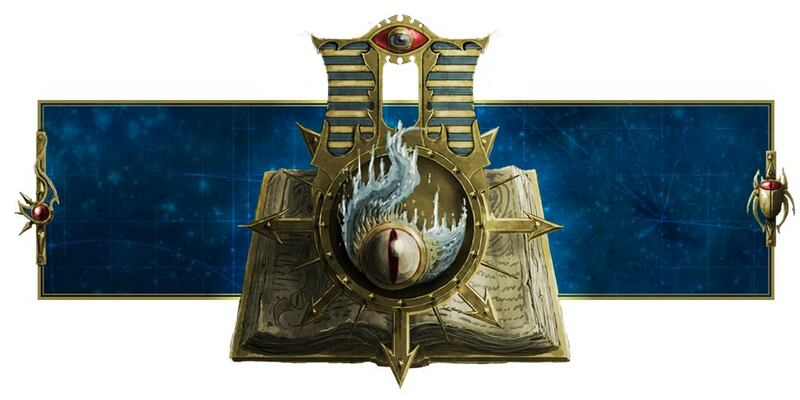 Once I"m done with it, I'm going to read the Adeptus Mechanicus series, beginning with Priests of Mars! I'll most likely buy Yarrick: Pyres of Armaggedon as well because I've been a fan of the wars on Armaggedon, especially the ones where Yarrick leads imperial troops to victory over the Orks, and the one where the Imperial Guard, with the Space Wolves' help, survives and drives away Angron and his World Eaters. Apparently they had help from the Grey Knights as well.